Does someone know what this oil tag was used for? It is about 5" X 1 1/2" and is porcelainized. 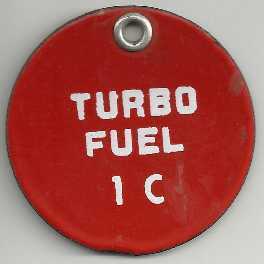 These were usually used to label large (bulk) containers at the fill spout, and some were used to label the fill openings on underground storage tanks--like gasoline station tanks, so the replenisher wouldn't put the wrong product in the tank! Don't know how "rare" they are, or what is used nowadays. As David said, ... used to label bulk delivery containers to suit the contents. They weren't all "disposable" back then, and containers got refilled, often with a different product, so the table was attached to match what was inside. I wear one that reads "Grumpy Old Man". Is it antique? It looks like a modern reproduction or someone's idea of an antique sign. I don't remember ever seeing anything like that in my dad's gas station. I'm sure they're old. I got them from a fella that worked for Union oil years ago. As I said, I don't know if they still use them, but they did back in 1978, at least at my Dad's station. They are usually in a place where they don't get weathered, so often look "like new". This one's from the early 60s, 2&1/2" diameter, was used on fill nozzles.